Tuesday September 4th 1894 Laura and I went down home to spend the day. the folks had just finished a big washing. Some of them went to the Kirkwood funeral in the afternoon. We came back to town and was in the Dr office when the procession passed. 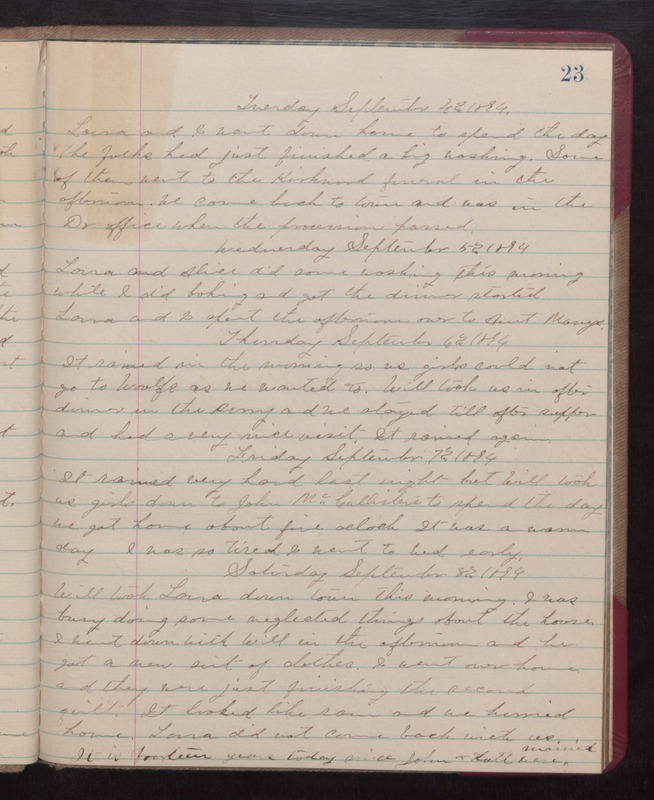 Wednesday September 5th 1894 Laura and Alice did some washing this morning while I did baking and got the dinner started. Laura and I spent the afternoon over to Aunt Marys. Thursday September 6th 1894 It rained in the morning so us girls could not go to Woolfs as we wanted to. Will took us in after dinner in the surrey and we stayed till after supper and had a very nice visit. It rained again. Friday September 7th 1894 It rained very hard last night but Will took us girls down to John McCallisters to spend the day. We got home about five oclock. It was a warm day. I was so tired I went to bed early. Saturday September 8th 1894 Will took Laura down town this morning. I was busy doing some neglected things about the house. I went down with Will in the afternoon and he got a new suit of clothes. I went over home and they were just finishing the second quilt. It looked like rain and we hurried home. Laura did not come back with us. It is fourteen yerars today since John & Hattie were married.